Capitec received a copy of the Viceroy research report on Capitec at 10 am this morning. Shareholders are advised that Capitec has not been approached by Viceroy for insight into our business and none of their allegations have been discussed, tested or verified with management. We believe our corporate governance is strong and our communications and disclosures are, and always have been transparent, clear and to the point. On the face of it, the report is filled with factual errors, material omissions in respect of legal proceedings against Capitec and opinions that are not supported by accurate information. We are reviewing the report in detail and will respond to it in detail later today. 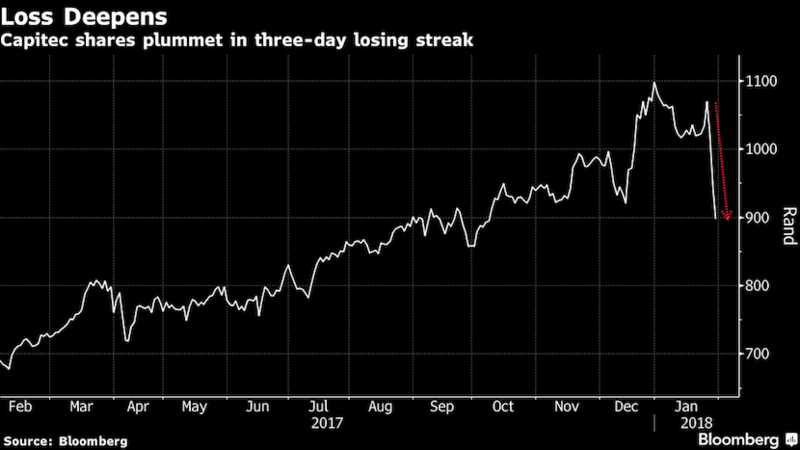 (Bloomberg) – The short seller who wrote a damning report about accounting irregularities at Steinhoff International Holdings NV has found a new target in Capitec Bank Holdings Ltd., South Africa’s best-performing stock over the last decade. The shares fell the most in more than 15 years before paring losses. Viceroy Research said in a report Tuesday that Capitec, which makes unsecured loans mainly to low- and middle-income households, may be concealing losses by refinancing loans that customers were unable to repay. Capitec may have to write down its loan book by R11 billion ($920 million) – equivalent to 14 percent of the bank’s assets – to “more accurately represent delinquencies and risk,” the report said. Andre du Plessis, Capitec’s chief financial officer, said the allegations are “totally unfounded” and he’s not worried about them. He said he hadn’t seen a copy of the report. While Viceroy didn’t disclose whether it has a position in Capitec’s securities, it said readers of the report should assume that the authors could profit if the bank’s share price declines. Viceroy operated anonymously until earlier this month, when Fraser Perring revealed himself and two other colleagues – Gabriel Bernarde and Aidan Lau – as the faces behind the firm. Perring, 44, was a U.K. social worker before turning to shorting stocks on a full-time basis in 2012. Shares of Capitec fell as much as 20 percent, the most since June 2002, before paring losses to trade 0.9 percent down at R935 as of 10:06 a.m. in Johannesburg. The securities declined 4.1 percent on Friday and 8 percent Monday. Before the selloff, the stock had risen about 30-fold since 2008. 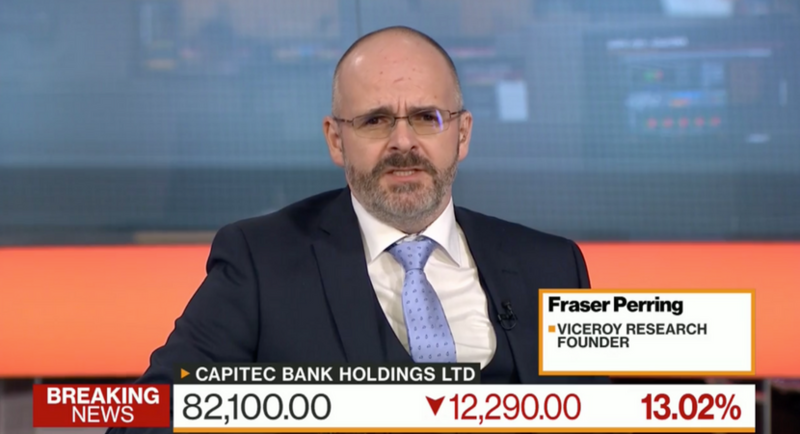 The valuation of Capitec, with a price-to-equity ratio of more than 20 times and price-to-book of more than six times means the stock was “very elevated and yet many sell side analysts were positive on the stock,” Rassou said. 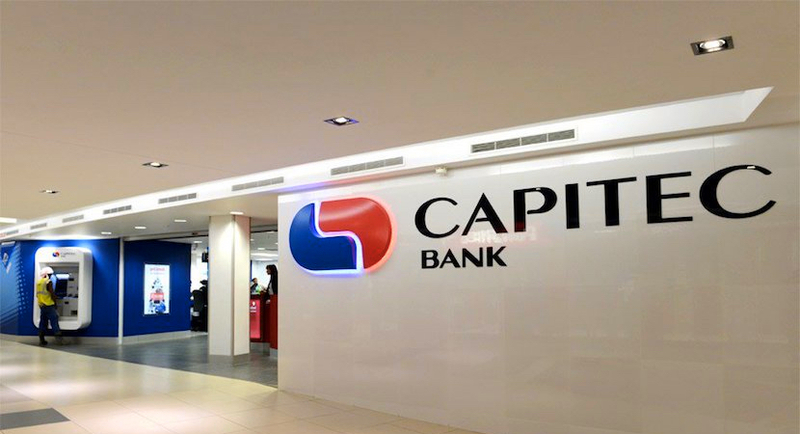 Founded in 1999, Capitec has grown to become South Africa’s sixth-biggest publicly traded bank by assets, increasingly competing against the largest financial institutions as it branches into consumer banking. Capitec’s largest owner, with a stake of more than 30 percent, is investment firm PSG Group Ltd. Steinhoff, in turn, was the second-biggest shareholder in PSG until last week, when it cut its shareholding to 2.5 percent from 16 percent. Capitec is the second South African company to come under scrutiny from Viceroy, which highlighted concerns with the accounting policies of retail giant Steinhoff in December. Its report came less than a day after the company announced an investigation into its finances that led to the resignation of its chief executive officer and chairman. The stock slumped more than 80 percent in the wake of Steinhoff’s announcement. 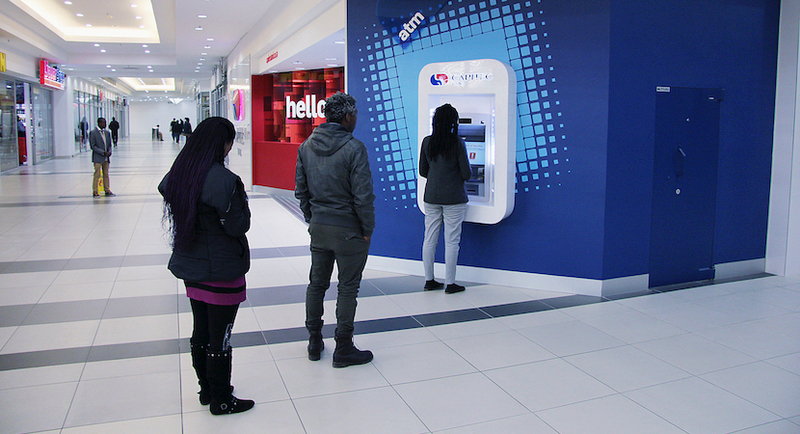 Capitec relies mostly on savings from its customers to fund lending. The bank’s retail deposits more than doubled in the last three years, soaring to R55.4 billion at the end of August up from R26.6 billion, according to its financial statements. Deposits increased 27 percent in fiscal 2017 alone, outpacing the 10 percent expansion in loans, which grew to R45.1 billion. Capitec is a big favourite of foreign investors. I imagine the share will come under more pressure once the US wakes up. Capitec and PSG dominating trade. The sell off is hurting sentiment on the whole market. All share well below 60000 down 1.7%. Rand 12.04. The rapid growth of deposits allowed Capitec to cut its debt to R7 billion from R11.1 billion in the same period. Its biggest rival, African Bank Investments Ltd., went bankrupt in 2014 after posting record losses, causing funding from bond investors to dry up, while the lender didn’t have a deposit base to fall back on. About 6.3 percent of Capitec’s gross loans and advances were past due at the end of fiscal 2017, a number Viceroy says isn’t credible given that other unsecured lenders such as Bayport Financial Services South Africa Ltd. have rates of around 30 percent. Bad-loan impairments jumped 37 percent to R5.45 billion in the 12 months through February last year, according to Capitec’s latest annual report. The increase was caused mainly by changes to its rescheduling policies, in which customers were prevented from rolling over loans for a second or third time if their risk was too high, the lender said. Viceroy said there could be about R2.5 billion to R3 billion of defaulted loans payable in 2017, but instead refinanced through new loans. The lender’s total loan book stood at 45 billion rand at the end of February. The report also argued that Capitec may have to refund fees charged on loans if it loses a lawsuit brought by Summit Financial Partners, which helps consumers work their way out of debt. Summit in 2016 accused Capitec of breaching the National Credit Act, which says that banks engages in “reckless lending” if they issue loans beyond what a customer can afford or don’t check whether clients fully understand the terms of the loan. A spokesman for Summit Financial didn’t respond to an email or message left at his office seeking comment on Monday. Capitec CEO Gerrie Fourie has vowed to fight the suit. Capitec assesses whether customers can repay loans and charges a proportional initiation fee for the service, he said at the time.